According to the Sensis Social Media Report 2016, 50% of Australian’s are now using social media at least once a day. As a result of statistics like these, it is no wonder that now more than ever, companies are beginning to understand the value social media brings to their brand at every stage of the business cycle. So what can Australian retailers do in 2017 to reap the benefits of using social media? While everyone was slowing down in the lead up to Christmas and the New Year season, here at Social Status we were busy analysing over 23K posts from 922 retail brands on Facebook. Because we wanted to discover what’s working in the world of retail, who’s performing best and what kinds of posts generate the best engagement. Our report showed that these media types were the best at generating interest amongst consumers, resulting in higher levels of engagement in the News Feed. Because this type of content provides audiences with a ‘richer’ user experience by offering more dynamic and visually engaging elements and is buzzing with opportunities. Based on the findings of our report, 6/10 of the posts with the highest Engagement Rates were competition posts. 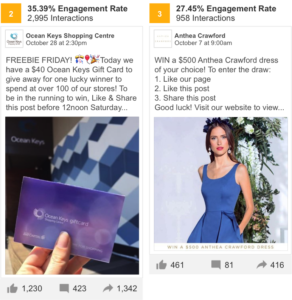 Traditionally these types of posts generate large amounts of interactions, resulting in higher Engagement Rates due to their like-to-win, comment-to-win or share-to-win entry mechanics. These types of posts are tactically the best option for boosting your Engagement Rate. On the contrary, they are probably not the best strategy for long-term brand building. Don’t spread yourself too thin trying to cover every aspect of the marketing funnel – it’s expensive and resource redundant. What was your company’s main objective for incorporating social media into their marketing strategy? The focus should be clear and you should be able to measure its success. It’s simple – if you’re wanting to increase your Engagement Rate, look towards rich media such as video or photos. For increasing your Click Through Rate, look towards link ads or carousel ads. One of the major advantages of using social media, is a company’s ability to continually monitor and employ an agile marketing strategies based on real-time performance indicators. It is essential for companies to be able to translate the business value of social media and answer the elusive question: what is our company’s social ROI? In order to do this, benchmark your historical and competitor performance month-on-month and/or quarter-on-quarter. Use your industry averages to assist in setting KPI’s and goals. Set up a Social Status account to start tracking your performance against competitors and industry.